This Group Decision Making workshop is ideal for anyone who would like to gain a strong grasp and improve their Group Decision Making. The duration of this Group Decision Making workshop is 1 full day. Knowles Training Institute will also be able to contextualised this workshop according to different durations; 2 full days, 1 day, half day, 90 minutes and 60 minutes. 1.Understand the concept of brainstorming. 2.Derive with quicker solutions to problems. 3.Generate a wider ranger of solutions and selecting the ideal one to implement. 4.Implementing correct methods of tackling with challenges. 5.Improve communication channel within the organization. 6.Create better sense of unity. 1.Adopting the method of discussing issues in a group. 2.Learn to work together with unity to derive solutions to problems. 3.Develop methods of creating brainstorming sessions for decision making. 4.Work together to analyze and evaluate challenges arising in the job field. 5.Overcome finger pointing and blame game situations. 6.Learning to engage and communicate ideas better without being hesitant. 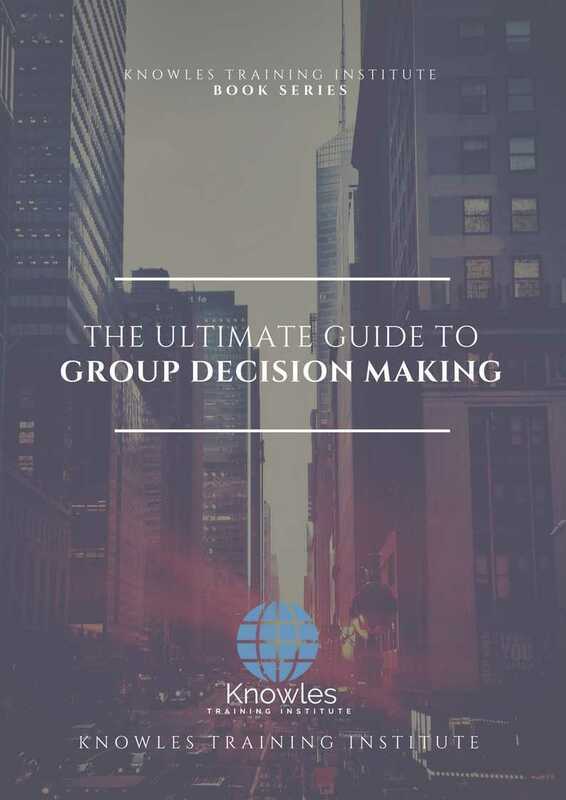 1.How is group decision making better than individual decision making. 2.Learn the methods of sharing ideas confidently with each other to improve group communication. 3.Understanding the concept of unity with the group. 4.Learning how group decisions are more effective and efficient in the long run. There are 3 pricing options available for this Group Decision Making training course. Course participants not in Singapore may choose to sign up for our online Group Decision Making training course. Request for this Group Decision Making course brochure. Fill up the short information below and we will send it to you right away! Register For This Group Decision Making Course Now! Share This Group Decision Making Training Course! Group Decision Making course, workshop, training, class, seminar, talk, program, programme, activity, lecture. 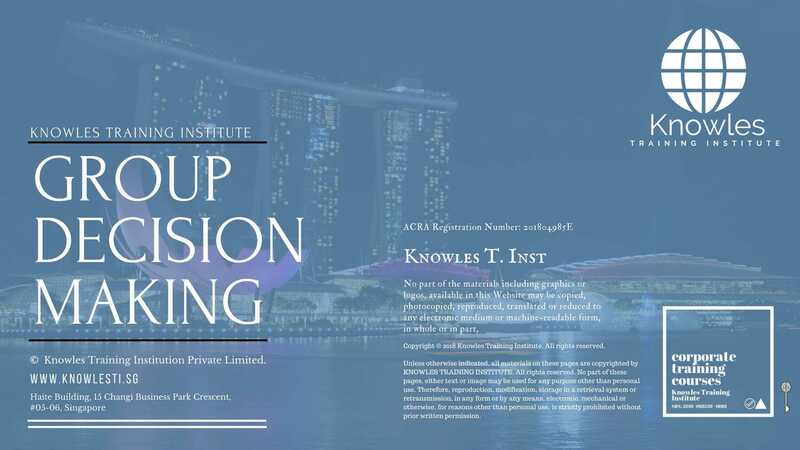 Group Decision Making courses, workshops, classes, seminars, talks, programs, programmes, activities, lectures in Singapore. Group Decision Making improvement tips, Group Decision Making techniques, improve Group Decision Making, improve Group Decision Making games, Group Decision Making improvement exercises, improve Group Decision Making power, how to have good Group Decision Making, how to have good Group Decision Making in studying, how to build up your Group Decision Making, how to improve Group Decision Making how to improve Group Decision Making course in Singapore. Enhance, boost, build up, enlarge, heighten Group Decision Making course in Singapore. Increase, intensify, raise, reinforce, strengthen Group Decision Making. Upgrade, amplify, boom, elevate, exaggerate, magnify, grow, gain Group Decision Making. Develop Group Decision Making, multiple, power up, beef up, bolster, establish, extend Group Decision Making. Invigorate, restore, step up, toughen, empower, fortify, regenerate Group Decision Making. Rejuvenate, renew, escalate, expand, maximize Group Decision Making. Powerful, mighty, impressive, competent, great, excellent, exceptional Group Decision Making in Singapore. Superb Group Decision Making. Super, superior, strong, solid, active Group Decision Making training courses and workshops in Singapore. Group Decision Making enhancement, booster, building up, enlargement, heightening, increment, strengthening, amplification. Group Decision Making magnification, growth, development, power, empowerment, regeneration. Group Decision Making rejuvenation, development, escalation, expansion. 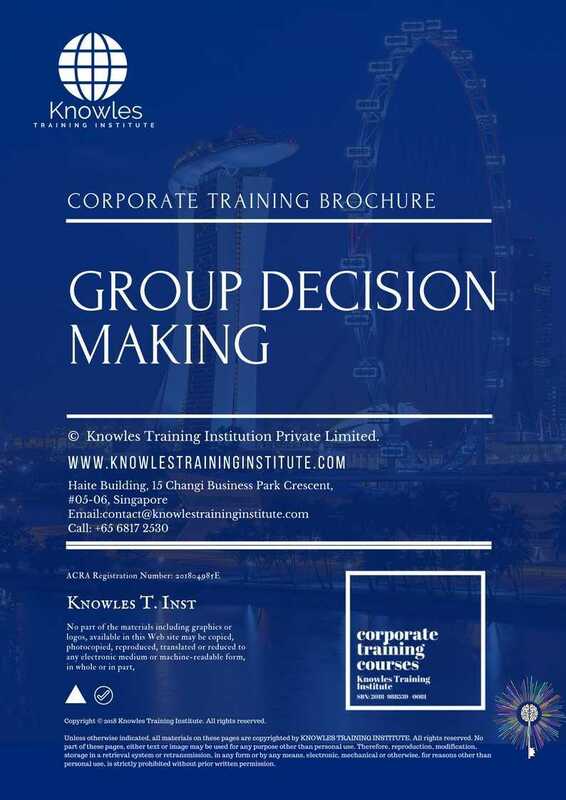 Group Decision Making maximization, power training courses & workshops in Singapore.